This site hosted by StewartFarm.org, 2007 Stewart Road, Harsens Island, Michigan 48028. Beaver Island shoreline before first Phragmites treatment. 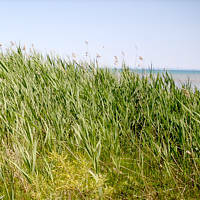 If you would like to be on a general email list to receive notices of other phragmites control events and information about controlling phragmites send your name to Newsletter@phragmites.org along with a message which says "subscribe."